The fact that it sent bishops to the Councils of Cologne (346) and Sardica (347) shows that Strasbourg was already an episcopal see in very early Christian times. The present cathedral is, however, more recent. The oldest parts – the crypt and the foundations which still support the walls – date from the time of Bishop Werner of Habsburg, who laid the first stone of the Ottonian building in 1015. This was destroyed by fire in 1179, and replaced by a Romanesque structure. The choir, completed circa 1200, was built first, followed by the north and then the south transept, which was probably completed in the 1230s. The south door before its destruction during the French Revolution. Engraving by Isaac Brunn, 1617. Strasbourg, Cabinet des Estampes et des Dessins. Photo : Musées de la ville de Strasbourg. The south transept’s architecture and sculpture mark the transition from Romanesque to Gothic, and are thus of special interest to European art historians. The statues of Ecclesia and Synagogue which flank the south door, and the Angel Pillar in the south transept, are among the finest examples of Gothic sculpture, and the first in the Upper Rhine valley. Dating, interpretation and stylistic analysis of all three are key topics of research in the European art-historical context, and each has been the subject of in-depth studies by leading experts in the Bulletin de la Cathédrale de Strasbourg. One volume of the Association’s recent monograph on the Cathedral is also devoted to them. The nave was built in two stages – from east to west – and completed in 1275 by the Cathedral Workshop’s masons. It has superb 13-14th century stained glass, and is a fine example of High Gothic – indeed, with Cologne Cathedral, the finest in the Rhine Valley. The Cathedral, north side. Engraving by Wenzel Hollar, Strasbourg, Cabinet des Estampes et des Dessins. Photo : Mathieu Bertola/ Musées de la Ville de Strasbourg. Work on the west front, the most spectacular part of the building, began in 1277. Its total height, including the slender, elegant spire, is 142 metres. Its finely detailed decoration and soaring verticals make it a perfect example of the Late Gothic architectural aesthetic, and it remains today what it has been since the middle ages – the Cathedral’s most celebrated feature. It made an unforgettable impression on Goethe, who studied briefly in Strasbourg in the early 1770s, and wrote rapturously of it and of its then presumed creator, Erwin von Steinbach – about whom we actually know very little. What we do know is that we owe the west front, not to a single creative genius, but to a long line of inspired architects and craftsmen who worked on it steadily, over a period of some 200 years. In that time, the design underwent a number of radical changes. 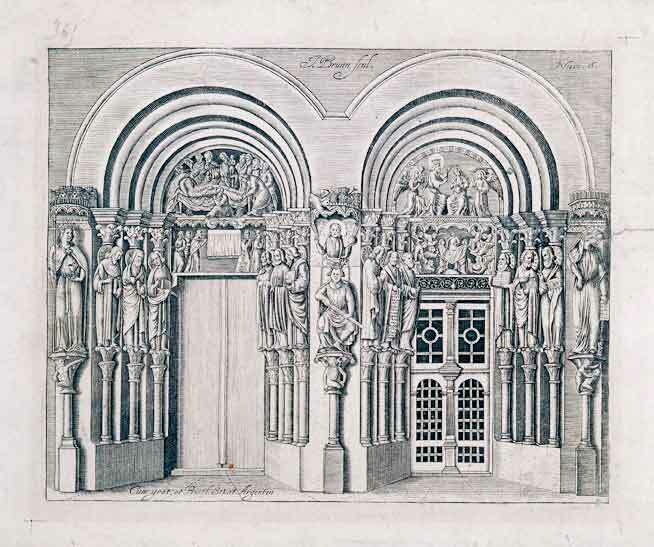 The first plan, dating from Erwin’s day, and preserved in the Cathedral Workshop Museum, has two towers – like Notre-Dame in Paris and the Cathedral of Reims. A later version inserts a bell tower between them, transforming the façade into a rectangular block topped by a vast terrace or platform. A further plan, by Ulrich von Ensingen (who also worked in Bern and Ulm) adds a huge, fretted tower. Yet another, prepared after his death, superimposes the present spire, with its fine stone tracery and turret stairways, on the tower. 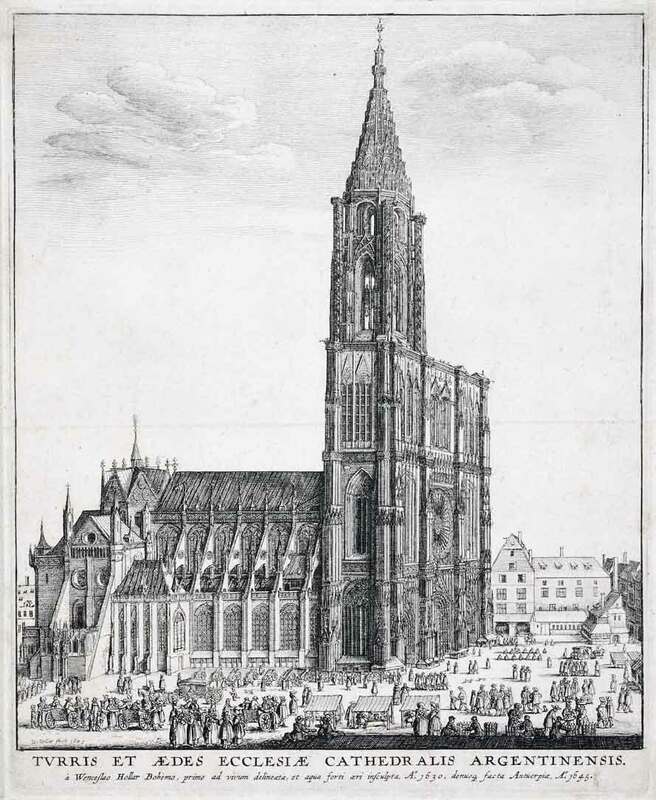 The building of the Cathedral was a uniquely ambitious project, and it makes a fascinating story – a story which has been told by numerous well-known experts, often in the Bulletin de la Cathédrale de Strasbourg. It is still being written today, and the Association’s other publications and lecture programme cover all the latest developments. For more information on the building of the Cathedral, visit the site of our partner, the Fondation de l’Oeuvre Notre-Dame (Cathedral Workshop Foundation). « Cathédrale de Strasbourg : travaux et interventions en 2018 », par des représentants de la Fondation de l’Œuvre Notre-Dame, de la Direction Régionale des Affaires Culturelles et de la Fabrique de la Cathédrale. En partenariat avec la FOND – Münsterhof 9, rue des Juifs – entrée libre et gratuite. Présentation de l’année écoulée et des projets de l’association, pot convivial – réservée aux membres. Notre sélection d’activités culturelles pour le mois d’avril (en français – auf Deutsch). Découvrez sur notre blog la vie de l’association. Numérisation des Bulletins 1903-2004 : appel aux ayants droit. « Die Aussichtsplattform des Straßburger Münsters und ihr Wächterhäuschen: Geschichte, Funktion und Vorstellung des aktuellen Projekts zur Umgestaltung », par Sabine Bengel. Conférence en langue allemande, organisée avec l’Historischer Verein Kehl e.V. – Kehl, Stadthalle, Zedernsaal – Entrée 4 € – 2 € pour les membres du Historischer Verein, de la SACS et pour les étudiants. Chartres et Le Mans – sur inscription, réservée aux membres. Trois sites de la Forêt Noire : Lautenbach, Klosterreichenbach et Alpirsbach – sur inscription, réservée aux membres. « L’évolution des principes de restauration des statues de la cathédrale, du XIXe au début du XXe siècle », par Vincent Cousquer. En partenariat avec la FOND – Münsterhof 9, rue des Juifs – entrée libre et gratuite.